Keukenhof is the world famous flower garden park – one of the most popular tourist attractions in the country, attracting 1.4 million visitors during springtime. If you are in Amsterdam during the spring then you should absolutely consider making a day excursion out to the Keukenhof Gardens park. 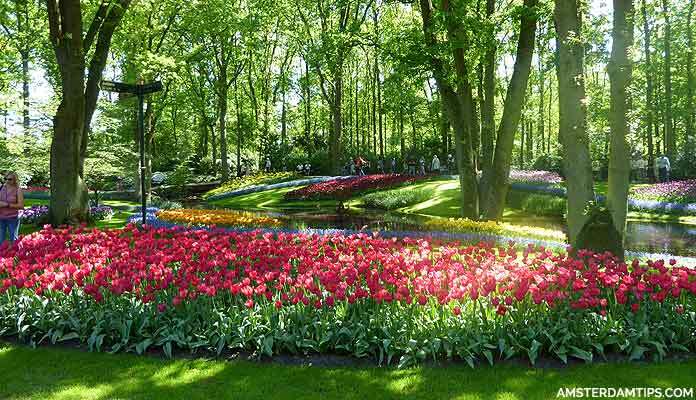 The Netherlands is well-known as a leading flower producer and Keukenhof helps showcase this reputation. Keukenhof is the one of the largest flower gardens in the world, set in 32 hectares and originally opened in 1949. It is located in the small town of Lisse about 25km south-west of Amsterdam in the Bollenstreek (bulb-growing) area of the country. The Keukenhof gardens are beautifully landscaped and contain some 7 million flowers – all hand planted – including 800 varieties of tulips and a fine collection of orchids. The park is only open for 2 months during the springtime with the best time to visit probably around mid-April. The Keukenhof 2019 season runs from 21 March to 19 May 2019 and the 70th year theme will be Flower Power, the strength of flowers. The Flower Parade will be on 13 April 2019. You can easily spend the whole day exploring the park and its 15km of walking paths. There are large indoor exhibition pavilions named after the Dutch royals – Willem-Alexander, Oranje-Nassau, Wilhelmina, Juliana, Beatrix and Irene. The pavilions host colourful floral displays which change on a weekly basis. One of the highlights is the world’s largest lily show at the Willem-Alexander pavilion on 8-19 May 2019. There is an exhibition about tulip mania (Tulpomania) at the Juliana pavilion, a traditional 19th century Dutch windmill, lots of water features and an electric boat ride (45 minutes) past the adjacent bulb fields. The park also contains many outdoor artwork sculptures. Themed gardens in 2019 are Love & Peace Garden, Strawberry Fields Garden (inspired by the Beatles), Happiness Garden, Flower Power Garden, Ibiza Garden and The Green Machine Garden. 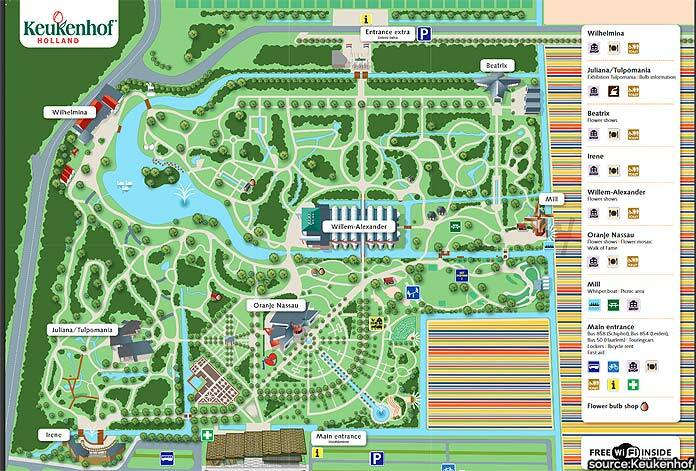 You can pick up a free Keukenhof map near the entrance to guide you around the park. There are café/restaurant facilities at each pavilion with outdoor terrace seating. There are many benches placed throughout the park where you can sit down and take a break. Free WiFi is available. For children there is a small farm, playground, maze and treasure hunt activity. A free daily guided tour at 1400 starts at the Juliana pavilion. Group tours can also be arranged at extra cost. It is possible to purchase flower bulbs which can be shipped worldwide. Outfit DDA Classic Airlines occasionally runs scenic flights from Amsterdam Schiphol and Lelystad airports. These fly over the bulb fields near Keukenhof using a KLM-branded DC3 Dakota aircraft at an altitude 450m. For flower and garden lovers the Keukenhof Gardens is a must-visit experience. Opening Times Open daily from 21 March to 19 May 2019 season from 0800-1930, last admission 1800. Getting There Arriva operate bus services from various points around the region (see below for more info). By Car: Accessible from the A4 motorway (exit Nieuw-Vennep) or A44 motorway (exit 3, Lisse). Arriva bus 852 (new for 2019) runs daily from Europaplein bus stop (near RAI Amsterdam) to Keukenhof up to 8x hourly. The journey takes about 33 minutes. A single ticket costs €7, day return €14 (no cash accepted on-board, payment by card only). To get to Europaplein from central Amsterdam you can take GVB Metro line 52 to Europaplein station, exit the station and walk across to the bus stop. Arriva bus 858 Keukenhof Express runs daily from Schiphol Airport to Keukenhof up to 8x hourly. The bus leaves from the airport Boulevard, come out of the station hall and walk right. This journey also takes about 33 minutes. A single ticket costs €5, day return €10 (no cash accepted on-board, payment by card only). If you are coming from Amsterdam and wish to stay later at Keukenhof then you can always take the 858 bus to Schiphol airport and change to the Amsterdam airport bus 397 which goes to the Leidseplein area of central Amsterdam. The Amsterdam & Region Travel Ticket is available at Iamsterdam visitor centres, NS, Connexxion, EBS, GVB ticket offices. This is a 1 day (€19.50), 2 day (€28) or 3 day (€36.50) ticket which is valid on all public transport in the greater Amsterdam region and is valid for the trip to Keukenhof. The ticket includes NS trains, regional buses (including bues 852/858/397) and all GVB Amsterdam buses, metro and trams. Note that a single day’s validity runs from 0000 (day 1) to 0400 (day 2). 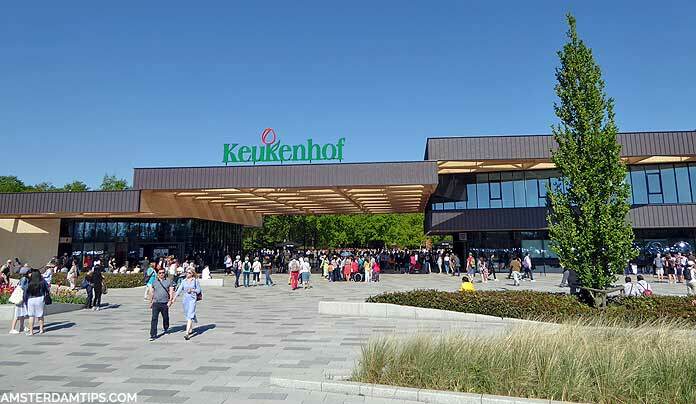 Other bus services to Keukenhof include Arriva bus 859 from Hoofddorp station, Arriva bus 854 from Leiden station, Arriva bus 50 from Haarlem station. A combi-ticket which includes Keukenhof entrance and the return 852 bus ride from Amsterdam costs €30 (children 4-11 €13.50). A combi-ticket from Schiphol, Leiden, Hoofddorp or Haarlem costs €25 (children 4-17 €13.50).